On the first day of sales in Lakewood in 1950, 25,000 people lined up to have a look. At the end of the first month, more than 200,000 people had flocked to the sales office, and more than 1,000 families had purchased homes. As many as 50 houses a day were sold, with a record 107 sold in one hour. With California’s problems of affordability and congestion, many of us are paying a higher price for an ever-shrinking sliver of California paradise. Even those lucky enough to be able to afford a home often do so at the expense of some of the quintessential perks of life in the Golden State. The downsizing of the California dream is readily apparent for Jenny Gov. In 2015, she and her boyfriend bought a home in Lakewood, a bedroom community near Long Beach that was once a classic example of the mid-century suburb and all that it offered — including easy access to good jobs, tight-knit community, the beach, the mountains and nearby Los Angeles. Gov and her boyfriend moved here seeking many of the same things tens of thousands of buyers before them sought in Lakewood, only today they’re paying a higher price and getting less. Most of the time Gov stays within a 10-minute radius of her house, if she even gets that far. “I try to drive as little as possible,” she said, pointing out the Target five minutes from home which constitutes her usual night out on the town. 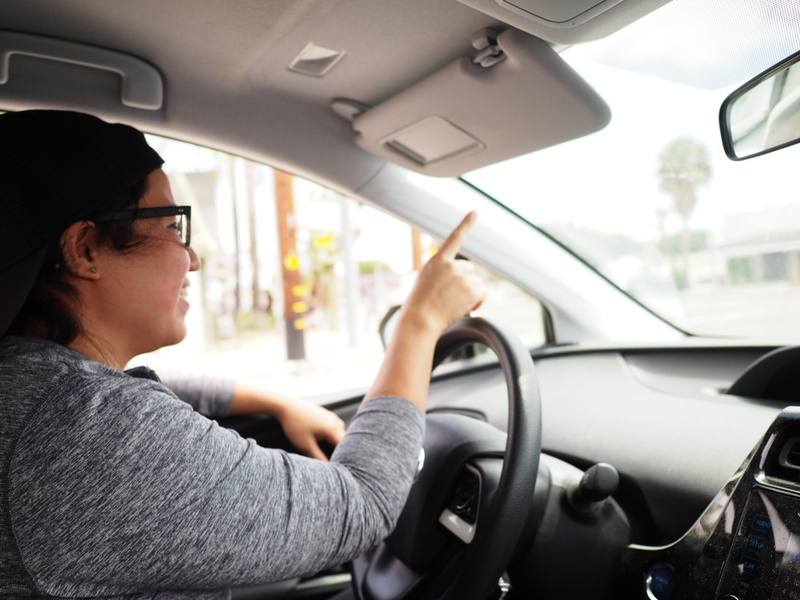 Lakewood resident Jenny Gov drives three to four hours a day to her job in Santa Monica so during her off hours she sticks as close to home as possible. 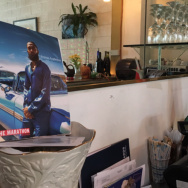 It’s a big change from her early life growing up in Los Angeles, when she’d go out to explore music and art, check out hip coffee shops or seek out a meal in one of the many ethnic enclaves of the city. Now her world is much smaller. She’s taken to meal prepping to avoid unnecessary trips to the grocery store, she does workout videos instead of going to the gym and she’s finally giving up the family dentist she’s had for more than 30 years. Gov, like an increasing number of Californians, has an extreme commute to her job. She works in communications at a non-profit organization about 30 miles away, up the notorious 405 to Santa Monica. On good days it takes an hour and a half each way, on the worst days it’s two and a half hours each way. “It’s literally like a part-time job,” she said. Gov’s boyfriend has a similarly long commute into Los Angeles. They wish they could live closer in, but homes closer to their jobs were way out of their price range. 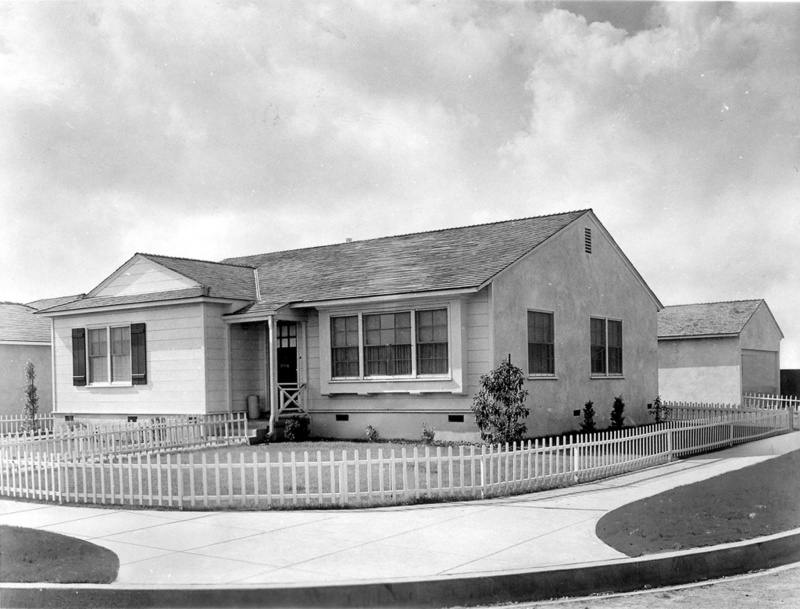 So they settled in Lakewood, among the rows of modest little ranch style houses, repeated in one of twenty or so iterations, interspersed with shopping centers, parks and schools. It’s a landscape that today appears completely unremarkable, but half a century ago embodied a powerful vision of the good life in California. “The promise of Lakewood was enough of the good things of an everyday life - a simple house, a yard, infrastructure of schools and churches and shopping centers,” said D.J. Waldie, the author and former city historian who wrote the book, “Holy Land: A Suburban Memoir,” about life in Lakewood from the 1950s, when the subdivision exploded out of lima bean fields into a suburb of 70,000. More than 17,000 homes were built with assembly line efficiency over a period of three years. They were bought up before they were even completed, mostly by working class families able to take advantage of generous federal housing financing. 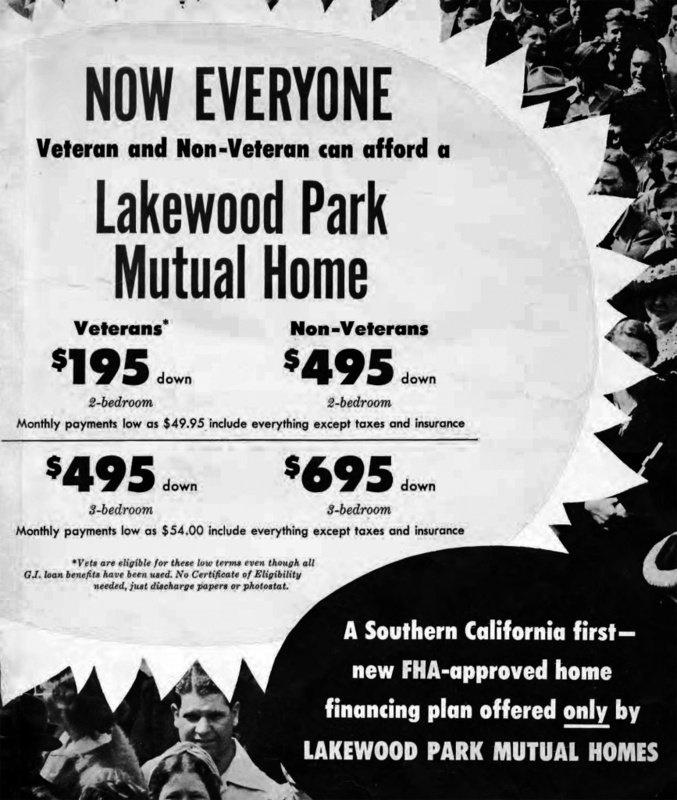 1952 Lakewood’s development never stopped, although the start of the Korean War slowed the financing of new construction. Many residents commuted to nearby aerospace jobs or the shipyards of Long Beach. Their paychecks afforded them not only a home but - with the new state of the art freeways – a world of things to do. “California made it possible to really reach out to and touch an awful lot of the natural beauty and cultural richness of the region - travel to the beaches, to the mountains, to the desert,” said Waldie, whose own family took full advantage of their access to California’s natural splendor. 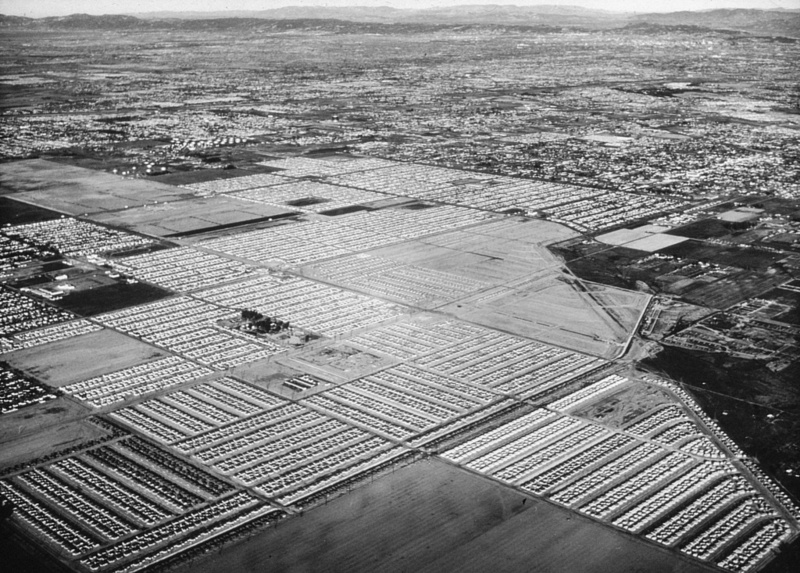 An aerial view of Lakewood, Calif. from the mid-1950s. But while the mid-century lanes of Lakewood have scarcely changed since then, what success feels like in today’s California certainly has. “It is a cruel reality of the current economic conditions that some of the ways in which an ordinary working class suburb like Lakewood made life better aren't available,” said Waldie. Those solid middle class jobs nearby have shipped out. To afford to buy here a lot more people are living like Jenny Gov - spending more of their day in ever worsening traffic, leaving little time to spend with family and neighbors, coaching little league or exploring the wonders of California. What California needs, he said, is more housing in areas closer to jobs, rather than the exurban sprawl he says has compounded the problem. But many communities have opposed denser housing in already built up areas over fears it will lead to loss of neighborhood character and greater traffic congestion. “And so now we don't build the housing we need, then we have huge a ramp-ups in housing costs which has big economic impacts and means people often live much farther from where they would like to, which makes the traffic worse,” he said. Building denser housing closer to jobs could alleviate some pressure in the housing market and shorten some commutes said Taylor, but it could also mean sacrificing the single family home part of the California dream, an ideal many folks - like Jenny Gov – aren’t ready to let go of. Is CEQA protecting natural beauty — or blocking affordable housing?